Medium sized, dome-shaped evergreen. Rose-pink flowers in late spring, later followed by purple-black or bluish-black fruits. 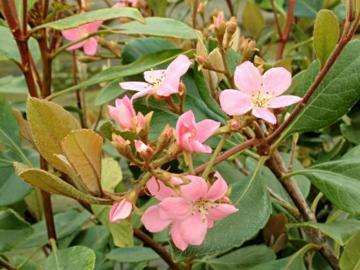 Glossy, leathery, dark green leaves, new growth has a russet-brown indumentum. Best in moist, well drained soil in sun or part shade and a warm position with protection from cold winds. Dislikes cold damp conditions in winter. Quite drought tolerant and thrives well in mild coastal locations. Can be trained as a wall shrub. Hybrid of R. indica and R. umbellata, raised by Mons Delacour, Cannes, France, in the late 1800s.